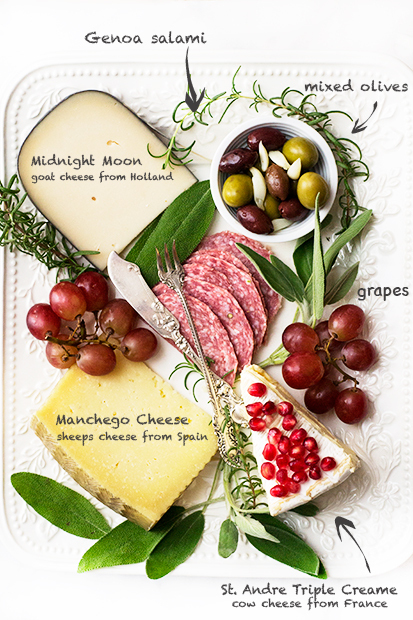 A quick way to decide what cheeses to serve, is to choose a theme. For example: a variety of cheeses from France or Spain. Another route, is an assortment of various textures – a great way to make sure there’s something for everyone. For example: a soft Brie, a semi-soft Stilton , a semi-hard Gouda, and a hard Grana Padano. Another variety that pleases crowds, is to choose cheeses by milk type. For example: a cow milk cheese like Pierre Robert (I was once told by a Frenchman in a very nice restaurant in Paris, ‘Pierre Robert is what Brie wishes it was’), a goat cheese like Humboldt Fog, and a sheep cheese like Zamorano. I also like to serve charcuterie with a cheese board. Personal favorites are Genoa Salami and/or my all-time love (while in Italy it single-handedly broke me of a 12 year vegetarian stint) Prosciutto de Parma, aka ‘God’s gift to meat’. Some seasonal fruit is a very nice compliment to the rich flavors of cheese. When in season; cherries, cantaloupes, red grapes, pears, and/or pomegranates seeds are great! They also serve as a bit of a palate cleanser. Other sweet components that are fantastic pairings are fig preserves and Membrillo (my personal favorite)! 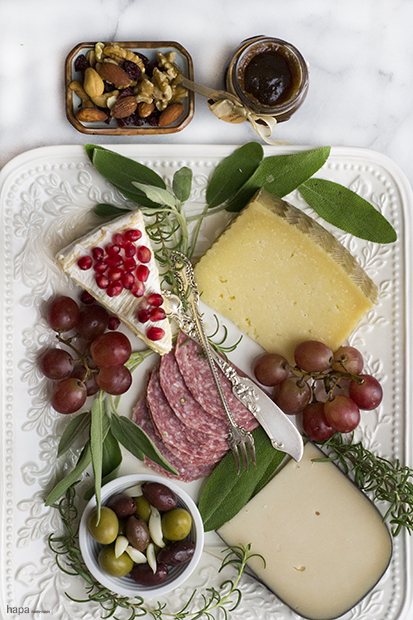 Other items that I like to serve with a great cheese tray, are a small bowl of mixed olives and/or mixed nuts. They’re small little bites that add texture and provide additional small snacks that please a crowd. Greens for a garnish are always well received, considering the aesthetics of a cheese board. Several sprigs of fresh rosemary, sage, and/or thyme are not only beautiful and fragrant, they fill in any empty spaces. Last, but certainly not least, are the vehicles to layer all of these flavors (the substrates, if you will), i.e. the bread/crackers. A nice crusty exterior bread with a soft inside like French baguette are always great. A crisp cracker variety is also nice, such as a nice sea salt or olive oil infused cracker for a crisp texture. 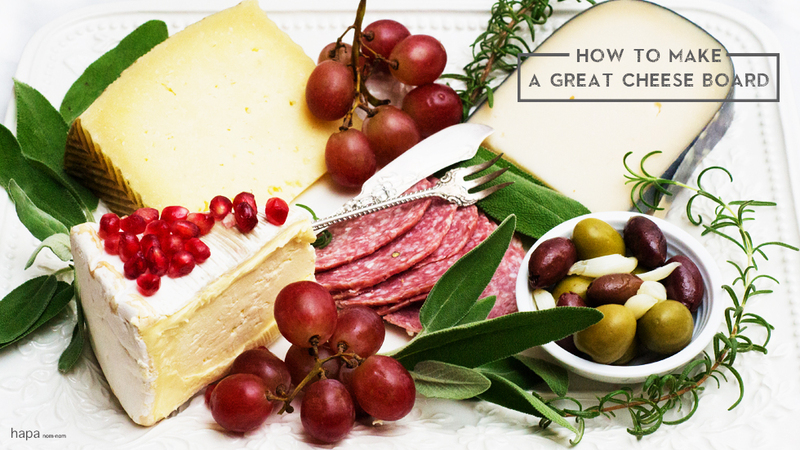 There are an infinite number of ways to prepare a great cheese board! Just remember to provide some variety to your guests, and this platter will certainly be one of the most popular dishes of the party! Plate the items and garnish with fresh herbs. Serve with crackers, fresh fruit, and or bread. Serve and enjoy! not only was this a lovely informative share (the beautiful herb suggestion rocked my world), but your “12 year vegetarian stint killer aka prosciutto de parma” comment made me giggle loud enough to wake my dog and make him quickly raise up his head all concerned like with both his lips jammed-stuck in his mouth (he is a boxer and their lips are often out of control) and his ears all bent over crazy-like. yummy and funny. and what’s up with that stupid long out of control sentence i just typed… hunger dissolving brain function here, kathleen. Lol! No worries! Seriously, I’m so sorry I’m just getting back to you – I just got back from conference in LA. While I was down there, I visited my aunt and uncle in Long Beach – they have a boxer too and she’s so sweet! Omg, I know what you mean about their lips being out of control! Her lip kept getting stuck on one tooth and her eyes would melt your heart – they just kept saying ‘please love me’. Aka, totally adorable! Aren’t dogs just wonderful?! I’ve seen (and drooled over) countless cheese boards, but yours really is gorgeous. I think part of it is the variety of colors you have going on here, not to mention all fabulous, delicious ingredients. All the fresh herbs just look so pretty! Stretch some plastic wrap over this baby and put it in the mail to LA. 🙂 Pinned x 2! Hi Nagi! I figured we would have similar tastes on this one! 🙂 Give the pomegranates a try with the Triple Creame – they compliment quite nicely! Now this is exactly how I would want my cheese board to look. A great read and beautiful post. What a beautiful picture and very helpful tips! It reminds me the first cheese plate I ever tried, while I was doing the student exchange program in Switzerland. I remember I didn’t dare to challenge the blue cheese (still cannot eat a lot) and I thought the goat cheese tasted strange. lol. Besides the varies types of cheese, I remember someone brought those mini skewer appetizer that is made from fresh mozzarella, olive and tomato. It’s really tasty for a cheese beginner, like me back then. Do you think it’s ok to serve mozzarella on a cheese plate? Some of my friends only eat very mild cheese. Yes, I think it’s absolutely ok to serve mozzarella on a cheese plate! If you can find buffalo mozzarella, that cheese will change your life! They’re like soft, creamy, little pillows of deliciousness! Another fabulous cheese that is similar to buffalo mozzarella, but even creamier (if you can believe it!) is burratta. They both pair well with figs, grapes, pears, and peaches (when in season). This is the most beautiful cheese board I’ve seen! Looks yummy, pinned and will make something similar for the holidays!